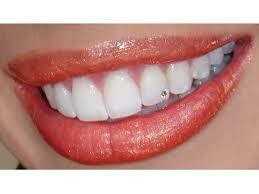 Are you fond of reflecting a glamorous smile? If yes, then try incorporating sparkling tooth jewelry to your personality. To those who are acquainted with what this is, here is a brief. Tooth jewelry is the latest fashion trend that has smitten the youth. It lets you display a beautiful smile that too without doing many efforts. You get to reflect a million dollar smile with sparkling Swarovski and studs to name a few. You can manage to make a fashion statement and stand ahead of the crowd with such unique items. The way you had options to accentuate your body with body art, tattooing and body piercing, you can now draw benefit from teeth jewelry. This new craze has lately swept crowd all across world. So, you can now shine like a diamond and stay glamorous always. Just as the name suggests, tooth jewelry relates to diamond studs, gem or crystal designed to stick firmly over the front surface of natural tooth while brightening the smile. These jewels are available in varied shape and sizes, hence offering boundless options to experiment with. When talking about the procedure that follows when fixing teeth jewelry, there is nothing as hard as rocket science. In most cases, it takes about 10 to 15 minutes for fitting the jewels. The jewelry is set over the surface using a dental composite material. You can choose amidst several designer studs ranging from crystals, diamonds to 24-carat gold. The best part is that the entire process is painless and involves zero risk with no need to drill the tooth. You do not have to worry about any side effects as these are easy to remove and do not cause any sort of damage to the tooth. So, ahead and say hi to beautiful smiles!